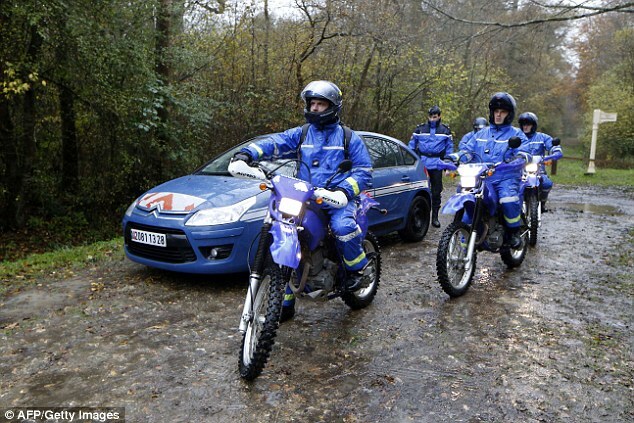 TTRs were used in France to hunt "big cats" a while back. This CLICKY takes you to the story in the Daily Mail. i am all for doing the right thing.... but these days, it will cost ya!!! Geez as kids, just ride and ride and ride. Spose it somehow works out. last time i was pulled up, was on a beach, something about some bird that only nest under 1 meter or something. Thats cool, birds should live, but do not remember running over (or seeing any birds) on that ride. Guess you have to go with the times. Is hard finding places to ride in Sa. Where was that pic taken. NZ is also going that way... most of the forestry is now gated off..
they exsisted or the ones they knew of.. were all closed off.. Totally agree, its getting bad. Its bad for me as my other bike is a quad, THESE IN VIC can ONLY be ridden on private property. I have not ridden it for 5 yrs.... why? you reckon i want to give it away to the state of vic if caught. Or pay a hefty fine. A few years ago, we (mates with trikes/quads) were going to go upto the nsw sand dunes. But no offence, 10 hrs drive to spend a few hours riding. Makes no sense. Best place i have ridden is fraser island, but that was like when i was a teenager. I'm sure it has changed now. That was mad fun. Hence going to reg rec/road reg ttr250. Just to avoid the dramas. That suprises me about NZ, i thought it would be way easy to ride around it. To be fair, .au has massive places to ride really, just nothing thats really local. Sure i could go up to swan hill, and not be hassled, but thats hours away, and you would need to go for at least a weekend/long weekend it make it worthwhile. Most of the local videos I do are within an hour of home, the Flinders is 500kms from home & the Victorian high country (Dargo) is close to 1200kms away so the Flinders & VHC are special trips. Your vids are awsome, some great footage, and great tracks/road trails. I'll end up doing trails like this for sure. Just doing things right.have the permits/reg first.... too old to be running away from rangers et al. Keep up the vids, i enjoy them. Also up for anything else worth watching. Local or o/s. Edit : typos kill me :) fat fingers, small tablet. Google translator- In Poland, all forests are closed. Little trails to drive. Only roads in the field. I'm not interested in driving on the streets and my bike does not have approval or registration because I do not travel far only I'm having fun in the area. And I'm happy too. I know Victoria is regarded as the nanny state in Australia but I reckon we are still very lucky with regards to riding off road. Recreational rego is available in Vic for about $80 and gives full TAC insurance (medical) at a fraction of full road bike registration about $600ish. And rec rego you can lose the blinkers and other stuff that gets busted off any way. With Rec rego you have to trailer into the bush to keep out of the towns and off main highways but you are legal on most back roads and all forests. Its no good for kids they cant get a licence until 18 so are stuck to private land, or run the gauntlet of getting fined for being unlicenced. A pain for me I have to trailer five minutes instead of ride (legally) from home. Unfortunately all the tracks in forests are classified as roads, but once registered and licenced you then have full access to the state forests and national parks, (aside from seasonal closures). And there is thousands of square miles of forests. There's only a small number of police special solos operating out of Melbourne mostly, so they target common riding areas out of Melbourne or complaint areas and patrol the popular riding spots and carparks usually. They mainly target licence and registration, drink driving by campers etc. And I only just found out recently in Victorian forests you are only legally allowed to ride on formed tracks that are designed to carry 4 wheeled vehicles. So the thousands of kilometres of single track out there that everyone seeks out and enjoys is technically illegal. :0 Ah well I figure if I got busted for riding single track the savings on Rec rego over full rego would cover the fine and its been years since I paid for full registration. And being Australia, traffic laws vary from state to state. So my advice, get out and ride legally before all the lefty greeny dogooders make it any harder. But I reckon good luck fencing it all off..!!! Well I think the Victorian riders have it made, we did a 1000kms around the VHC in March & didn't come across another bike, the forest trails were great & some of the best riding I have done. My 250's are $90 each for 3 months lot more than $80 per year for REC rego & agreed ride while you can before you loose it, I've been riding around this area for 46yrs & seen many changes over the period. Great info there, i'm not 100% current. But sounds about right to me. My closest "legal" riding area is angelsea vic. Aint been there in donkeys. Last time i was there , took a sick day(cause i was sick ok) saw a dozen riders. No cops/park rangers. I have heard it's way busy these days. I guess i'll find out. Yeah i agree, .au is massive, good luck trying to police it all. The only real spot i wish to ride is wombat state forest. It's massive, will do the right thing as mentioned, do not need the drama, fines... perhaps i am being a bit of a worry wort. Your still a lot closer to Dargo than I am & of course you also have Mansfield as well, all trailer jobs. I bought a new trailer 3 yrs ago & it's set up pretty well for the bike with a drop in front bar for the wheels with tie down points...makes it much easier for the Flinders or VHC. It's hard to imagine no place to ride, or being fined for off roading. I live in Utah USA and it's 80% public land, which means almost anywhere off road with a cheap permit or licensed bike. I have a 2003 TTR250 converted to street legal and a Kawasaki KLR650 for the longer trips. We take a yearly around-the Great Salt Lake ride that takes 2 days and 500 miles, mostly dirt. Impressive. Thanks for sharing these. Planning to use set XD wheels for my next trip. Hoping it's worthwhile. Looks smart, is there tricky stuff as well? Oh yes. Many many rocks. It's hard to imagine no place to ride, or being fined for off roading. I live in Utah USA and it's 80% public land, which means almost anywhere off road with a cheap permit or licensed bike. Word, work to keep it open and free, this is getting to be some of the last of it on the planet.